Tools are cool and lasers are cool, so we can pretty much assume that tools with lasers on them are double cool. So when Johnson Level sent over their 40-0921 self-leveling cross-line laser, even though I have used other cross-line lasers, I knew I would have fun testing it out. So after getting the kit out of the box, the obvious next step was to take it to the jobsite and put it to work. The Johnson 40-0921 comes in at a price of around $100 which puts it in the price range and class of a DIY laser; you do lose a few features at this lower price, but this kit also has a lot to offer. 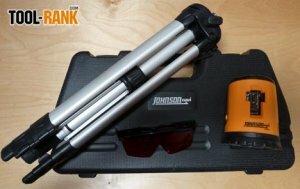 The 40-0921 Kit comes with the self-leveling cross-line laser, 3 AAA batteries, an extendable tripod, tinted viewing glasses, and a hard carrying case. The same laser can be purchased by itself without the tripod or glasses for a little less, and it comes with a soft case. What are we missing with a less expensive laser? Well the first thing you will probably notice is the size of the laser; it is around double the size of a laser that is twice the price. The next thing lacking is features. The laser offers both vertical and horizontal leveling lines, but both are always on at the same time. The last thing missing is the ability to lock the laser into position, so you can use it to project non-level lines. Lastly the laser can not be used with a laser detector. So now that I have pointed out what the laser is missing, let me tell you why all of those so called missing features do not matter to your average DIY'er. 1. Sure the laser is bigger, but small gadgets always come at a higher price. 2. Do we really need to see only one laser line at a time? Yes having both lasers on at the same time will run the battery down faster, but again, adding that feature would increase the price. 3. Do you need to set non-level lines? I have another laser that has this feature, but I have never used it. 4. I don't even own a laser detector, therefore I do not want to pay for a laser with a feature I will never use. Actually the only feature that I missed from this laser was a wider degree of spread that you get with the pricier models. This laser projects a line that is only around 105-degrees, while the pricier models have between 150-degrees to 180-degrees. The get around this shortcoming we can either move the laser further away from the wall to project a wider line, or we can use the 360-degree swiveling base that the laser is mounted on and simply spin the level in place. Sure we might have to walk back to the laser to give it a spin from time to time, but what Johnson did here was turn a 105-degree laser into a very usable 360-degree horizontal laser. The vertical lines are still limited to their 105 or so degrees. The included tripod in the kit is very handy and I used it hand in hand with the laser level on the job. It works great for lines up to around 4-feet high, and folds down to a compact size. The red glasses that came in the kit do help to see the line of you are outside, but if you are in really bright sun, the line can be hard to see; indoors there is really no need for them. The Johnson 40-0921 is actually a very good cross-line laser level for the price. If you just want it for simple level lines, it is a good start. If you need any of the advanced features, there are other more expensive models for you. I took the 40-9021 laser to work and used it to help me set a 30-foot length of wall panels as well as set cabinets and reception desks, if can work for me, it should work for most DIY'ers and other light duty tasks.